If you would like more information about the Sinfonia, please feel free to email us. 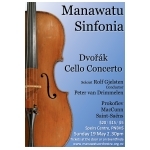 We welcome Rolf Gjelsten, long-serving member of the New Zealand String Quartet, who is to perform the Dvorak Cello Concerto with the Manawatu Sinfonia at our upcoming concert on 19 May. Click here for MYO Rehearsal information. Click here for Sinfonia Rehearsal information. Click here for details on how to join the Manawatu Youth Orchestra or the Manawatu Sinfonia.